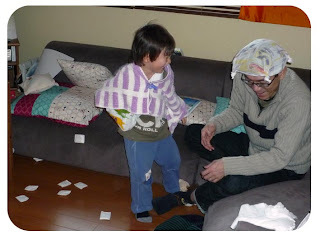 Ebi-kun and daddy-ebi were home on Saturday because of Ebi-kun's broken arm. They usually go to football practice but instead they stayed home to drive me nuts! I was trying to get some sewing done so I kicked them out of the house with a list with things like a hexagon, the number 7, a fire truck, a gatcha gatcha machine... and the camera and told them to take pictures of everything on the list. That bought be about an hour and half, then they were back, driving me nuts again. Ebi-kun really wanted to have a snowball fight, lack of snow and an arm in a sling was the problem. I gave him a pile of cotton pads (all out of balls) and they entertained themselves for ages. Of course, to have a snowball fight, one must wear the correct attire, a stripy towel cape or a knotted hanky on the head! and, yes, I did manage to get some sewing done!